In 2000, I opened my own studio, where I both practice and teach glass art. I work mostly to commission and for exhibitions. I work using contemporary leaded techniques as well as fusing, painting, sand blasting, and kiln-forming. I exhibit regularly in group exhibitions, with the Scottish Glass Society and elsewhere. I have had solo exhibitions in Falkirk Park Gallery, Peter Potter Gallery in Haddington, Harbour Gallery in Port Seton & in the Royal Lyceum Theatre, Edinburgh. 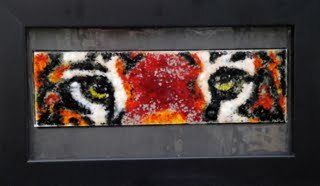 I give individually designed lessons (up to 4 students, but usually one or two) in glass fusing and sandblasting in particular as well as other methods. For further details and to apply, email to the address above. 2010: Shine, Queen's Gallery, Dundee. 2011: Three Harbours Exhibition, Harbour Gallery. 2012/3: 17th Nov -26th Jan 2013, 'Winter Warmth', at Callendar House Gallery, Falkirk. 2014: in July, some of my windows featured in BBC2 programme 'The Secret History of our Streets' about Moray Place, Edinburgh. 2015: Feb. A stained glass front door features in '25 Beautiful Homes' magazine. 2017: 'Heritage', Gallery10, Edinburgh SGS exhibition Aug 14-Oct 1st. 2017: Pop up Art Exhibition in association with Pentlands Book Festival, 26th November. Following my scientific career I studied at Leith School of Art and The Open College of the Arts, and attended several glass courses including two Master classes at Northlands Creative Glass Studios. I have commercial installations in Crief, a 'famous grouse' window at the Glenturret Distillery. I made 4 backlit wall panels for Bar Habana, Edinburgh. 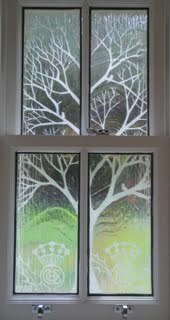 I designed and installed 10 windows/door panels in Balerno Parish Church in 2007. In 2008 I designed, made and installed (with the help of the metal worker) a metal and sandblasted glass decoration for 8 full-length windows, and an above door window, in the new Inverkeithing Civic Centre. 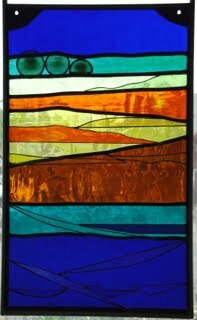 I have 3 fused/leaded panel in the Mill Cafe, Balerno. Recently completed a commission of a front door in the Borders, and a Glass light box 'Cycle of Life' for the new St Columba's Hospice, Edinburgh.